last July, i shared about the constitution of a new team around a grant to study Team-based learning in Mathematics in a few secondary schools in Singapore. through God's grace alone, the team's work has been accepted as a paper - titled enhancing Maths curriculum through Team-Based Learning - at this year's conference for the international group for the Psychology of Mathematics Education (PME 43) to be held at the University of Pretoria from the 7th to the 12th of July. the team will be represented at the conference by the lead author of the paper: Leong Swee Ling. yesterday i wrote about how an education research programme that my team and i have greatly benefitted from, had finally ended. as one chapter ends, so another - through God's grace - begins. one of the grants i manage is Enhancing Mathematics curriculum through Team-Based Learning. my team of five Research Assistants and i are excited about this grant, because it is our second active grant with an explicit focus on Mathematics. not only that, the funding awarded is double the quantum of our first grant, at US$145000. this move in to understanding more about Mathematics education reflects a trajectory we began in 2015, through our Maker Motes approach. my team and i would like to express our heartiest congratulations to our friend and intern - Lionel Lim - for being awarded Gold for his effort in conceptualising, designing, building, and enacting Redstone Jammin’ - collaborative music making in Minecraft. Lionel’s Gold award comes from the Nanyang Technological University’s Nanyang Research Programme 2017.
back in April, i shared that my intern’s work on a learning environment for collaborative music-making in Minecraft will be shared at this year’s international conference on Human-Computer Interaction (HCII 2018). i have just been invited to chair the session, which will be under the Learning and Collaboration Technologies track of the conference. our session is entitled ‘interaction design in collaborative and learning environments’, and will take place from 4 pm to 6 pm on Wednesday the 18th of July at Caesar’s Palace. Redstone Jammin’ - the learning environment for collaborative music-making which was conceptualised, designed and built by my intern Lionel Lim - will be shared at the 20th international conference on Human-Computer Interaction (HCII) 2018.
i will be speaking on Lionel’s behalf, and our slot is scheduled between 4 pm and 6 pm on Wednesday the 18th of July, at Caesar’s Palace. our presentation is under the Learning and Collaboration Technologies track. the session is titled Interaction design in collaborative and learning environments, and is organised by Habib M Fardoun. in December, i introduced Redstone Jammin’ - a learning environment for collaborative music making, which was conceptualised, designed, and built by Lionel Lim. Lionel had the opportunity to share his work earlier today at this year’s symposium of the Nanyang Research Programme. my team and i first started thinking about intuitions and learning around May 2011, as we were trying to deconstruct with teachers on the Six Learnings programme their observations of students who had gone through our curriculum since 2009.
just a little over three years later, we successfully published our book on Disciplinary Intuitions. through God’s grace alone, our work has continued to grow and evolve. another three years have since passed, and i feel it is a good time to pause and reflect upon what we have learnt thus far. with the benefit of hindsight, i believe what has driven me all these years has been a commitment to help teachers have a clearer understanding of where their students are coming from. too often, we as teachers have been guilty of either falling in to the empty jug paradigm, or, of thinking of learner misconceptions as unimportant and something to be over-written as efficaciously as possible, or, of not being cognisant of the differences in how experts and novices frame disciplinary knowledge in the first place. to some extent, curriculum frameworks such as Teaching for Understanding and Understanding by Design have tried to encourage teachers to address learner misconceptions. our team feels that more can be done, because we feel that addressing learner misconceptions is only the tip of the iceberg, and - congruent with the Chinese proverb of ba cao chu gen (if you want to pull up the grass, you must take the roots out) - we see learner intuitions as undergirding the conceptions that learners bring to the learning environment. the problem with trying to address intuitions, of course, is that they are - by definition - tacit. put another way, the difference between magma and lava is that once magma breaches the surface of the earth, it is termed lava. likewise, it might be argued that once intuitions are surfaced and made ‘explicit’, they cease to be intuitions. further, at the risk of lapsing in to stereotype, in many learning environments across East Asia, students may be reluctant to share with authority figures what they truly believe or feel, instead preferring to second-guess what their teachers might be wishing them to say. over the years, as we have dialogued with and reflected with teachers in Singapore and further afield, we would like to believe we have come up with a handful of curriculum designs which give teachers an insight as to learner intuitions, in a variety of disciplinary domains. our first example is from geography. 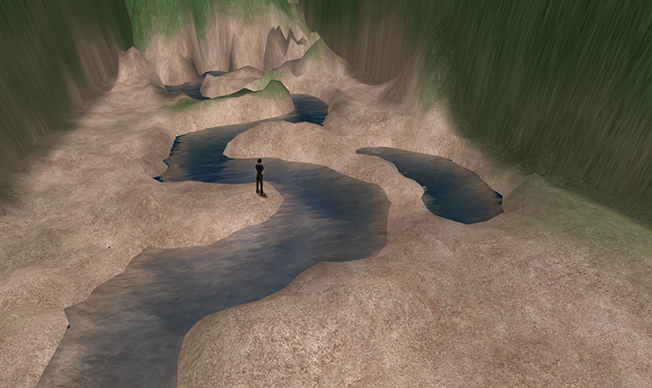 the diagram below shows part of a river basin terraformed by a student, within an immersive environment. in the diagram, it can be seen that the student has terraformed a meandering channel and an ox-bow lake. all looks well, and congruent with content from the textbook. upon closer inspection, however, it becomes evident that although the student has recalled from the textbook his / her knowledge of ox-bow lakes and has attempted to apply that knowledge by terraforming one here, the student has not fully understood the hydrological processes which lead to the formation of such lakes in the first place. i will not say more lest i give the game away, because it’s good that we each get our thinking caps on :-) suffice to say that it is quite possible for students - be they from East Asia or otherwise - to reproduce word-for-word content (including descriptions of hydrological processes) from the textbook, even under examination conditions, and yet come away with an inaccurate understanding of what they are writing about. such students will of course get tripped up by twists in the questions, but - by that time - it will often be ‘too late’. best to catch their misconceptions early, by designing environments in which their nascent and emerging intuitions are still malleable. 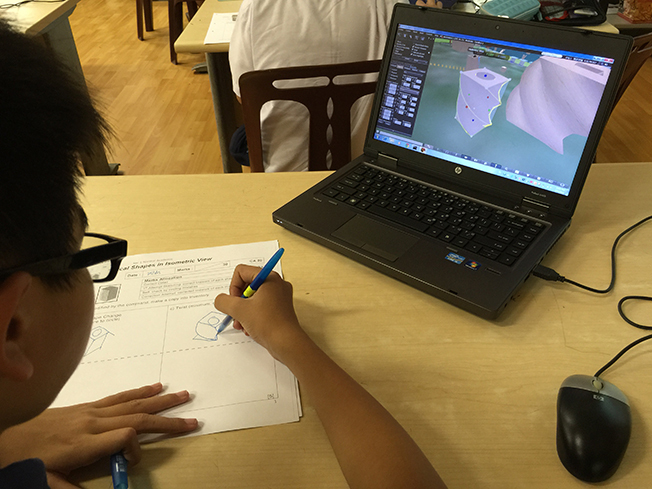 our second example is from the subject known as ‘design and technology’ in the Singapore syllabus. one of the problems faced by teachers is how to help students bridge between two-dimensional representations vis-a-vis three-dimensional objects. 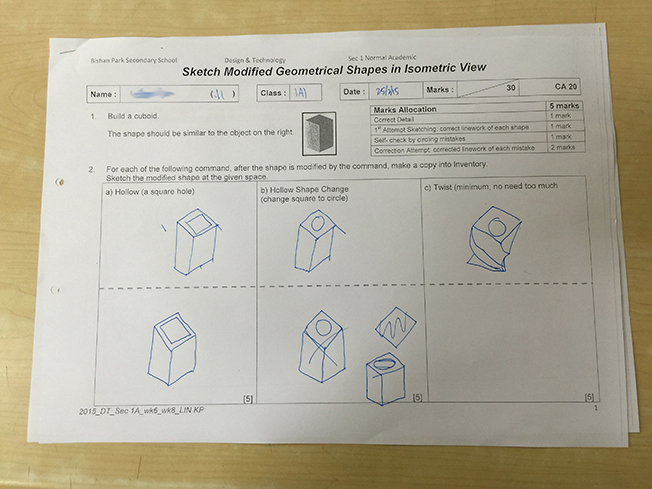 in the diagram below, a student is tasked to sketch simple three-dimensional primitives as they are progressively distorted in shape. it can be seen that from this subsequent diagram that even though the task appeared to be a straightforward reproduction of an on-screen rendition to the sheet of paper, the work of the hand did not quite match up with what the eyes would have been seeing. our third example is from analog electrical circuits. we were approached by a colleague from our university’s School of Electrical and Electronic Engineering to help him address the problem of understanding why his first-year undergraduates could solve circuit diagrams during paper-based assessments, yet were unable to correctly articulate the reasons why. helping novices understand the principles of electrical current flow has been a perennial bugbear in electrical engineering courses. one of the common ways to approach the problem has been to use metaphors for the flow of current. such methods have been useful but are not without their own conceptual inaccuracies. 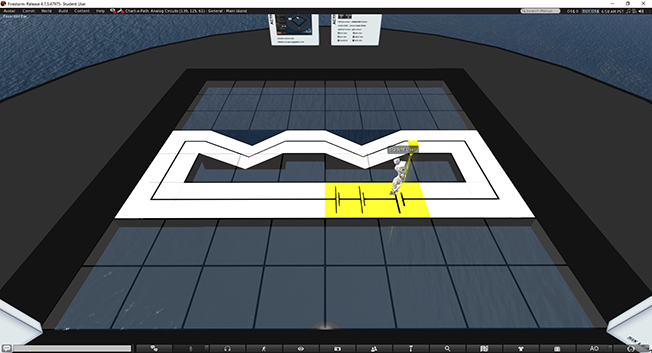 after much dialogue with our colleague, we came up with an open-ended learning environment within OpenSim which was deliberately designed not to resemble anything remotely similar to canonical representations. this was because of our repeated observations that when presented with forms of assessment resembling canonical representations, many novices perform ‘to the test’, with the consequence that their performance does not give teachers accurate understandings of what the novices truly believe or intuit. teachers are thus unable to design adequate intervention strategies. the diagram below is a representation of an electrical circuit designed by a student. the representation is designed as the learner-as-avatar walks around the learning environment, quite literally charting his or her own path. Our Chart-a-Path environment affords the learner latitude in circuit design, while at the same time leveraging Jim Gee’s understandings of projective identity through embodied cognition. the preceding diagram depicts a simple series circuit. no annotations or colourings were made by the student to demarcate where the resistors would be in this circuit design despite having two ‘troughs’. Though there are visible change in elevation (translated to voltage in this metaphoric activity), it is unclear if the student actually understands the implications of the design, especially given the fact that while the yellow portion of the design suggests an increase in voltage of three units, the tiles are still level. our final example is from music. taking a leaf from our preceding case study, we asked ourselves how novices are often introduced to musical composition. very often - just as is the case in electrical engineering education - the answer was: through canonical representation; greatly simplified - yes - nevertheless still canonical representation. even so-called ‘gamified’ or playful approaches - such as the use of immersive environments - did not truly seek to acknowledge that novices have very different starting points from experts in canon. for example, although Minecraft has been used in music education, its use has thus far been limited to the creation within the environment of facsimiles of ‘real-world’ instruments, such as keyboards. with the help of one our interns, we realised that Minecraft - through the affordances of ‘note blocks’ and ‘redstone’ - afforded learners some truly playful ways to approach the creation of tones and simple musical compositions, in ways which bore little resemblance to established canon. we have termed this approach to music composition Redstone Jammin’. the diagram below is a plan view of a redstone circuit constructed in Redstone Jammin', designed by a student with a formal background in music education. the student’s construction looks unremarkable, until it is played. to sum up, it has been a remarkable journey over the years. 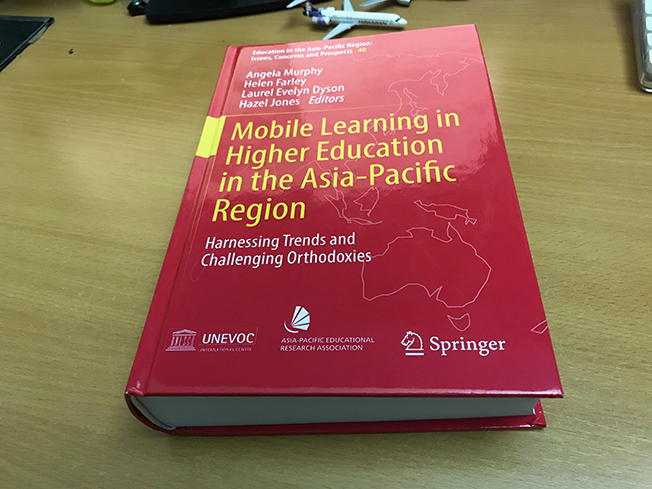 i am heartened to note that the recent articulation by the Ministry of Education of the Singapore Teaching Practice has - as one of its key components - ‘understanding students and learning’. through the use of examples from the natural sciences as well as the arts and humanities, i have tried to advance the argument in this treatise that the intuitions that learners bring to their learning environments are important, and that they are myriad in form. just as significantly, i have tried to suggest ways in which learning environments might be designed to surface such intuitions, for subsequent dialogue among peers and expert others. the National Institute of Education, Singapore, will be receiving a delegation from Seoul National University (SNU) on the 9th of February 2018.
by God’s grace alone, my team and i have been invited to participate in the day’s proceedings and interact with our visitors. The delegation is led by Professor Song Jin Woong, who is the Director of the Globalization and International Collaboration committee of the SNU, and comprises Social Studies educators Professors Kim Hee Min and Mo Kwung Hwan, as well as Physics educators Professor Yoo June Hee and Dr Park Ji Sun. the theme for the day will be Building bridges: fostering international research collaboration in education. our team and i are tentatively presenting on Multidisciplinary collaborative learning environments and learner intuitions on Science, Technology, Engineering, the Arts, and Mathematics (STEAM). we hope to be able to share on our existing collaboration with the Universitas Pendidikan Indonesia - on the open-source environmental sensors we call Maker Motes - as well as on our latest project on collaborative music making with Minecraft, which we call Redstone Jammin’. earlier today my team and i conducted what we believe is a first-in-the-world design for a learning intervention specifically leveraging the properties of redstone in Minecraft, for a collaborative music-making activity. conceptualised, designed, and built by our high school intern - Lionel Lim - the music composition environment deliberately steers clear of mimicking codified representations of music and musical instruments. it is instead designed to surface the naive and evolving intuitions about music which learners with little or no formal background in music education might have. in this way, it is aligned with our team’s existing work in Disciplinary Intuitions. Minecraft was chosen as a music creation tool and environment because it represented a way to explore the nature of the social collaboration associated with group-based music-making from the perspective of embodied cognition. That is to say, instead of presenting participants with facsimiles of virtual instruments (say, in a manner similar to the popular music creation app Garageband from Apple), a three-dimensional environment was designed and built within Minecraft in which participants – through their avatars – would be able to explore and interact with elements within the landscape concurrently and collaboratively. In turn, their interactions would result in tones being generated, and participants would be given opportunities to influence the resulting music through the editing (or ‘modding’) of the in-world elements. Such interactions are possible because one of the phenomena engineered in to the Minecraft environment is analogous to the presence of electrical current flow. From the perspective of the learning sciences, the study leverages principles of embodied cognition. It also draws on the work of Gee (2007) with respect to his work on the notion of projective identity. From the perspective of musicology, the study was designed as a response to Baker’s and Harvey’s (2004) work on ‘music as social behavior’, in which they considered a range of ways in which the social psychology of music might be empirically investigated. They concluded their chapter by drawing attention to a wide range of social psychological research questions that remain ripe for exploration, and encouraged researchers to “use imaginative” methods in approaching them. Understood thusly, our approach does not focus as much on the nature of the actual music collaboratively ‘composed’, but more on the social processes through which participants seek to create (what might be eventually be construed as tuneful) music in the first place. As such, Laurillard’s (2001) work on conversational frameworks was used to analyse the transcripts of conversations among the participants as they seek to make music. Specifically, the focus is on how any participants might have taken initiative to ‘step up’ to guide their fellow participants in aspects of the interaction in which they may have been more proficient (such as music background in determining the cadence of the notes).